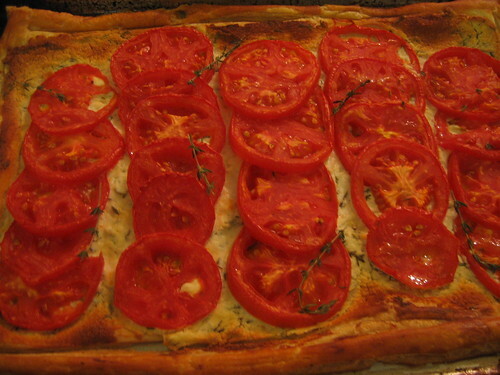 This week, in response to the torrent of reader requests for a savory specialty, I present you with a fresh tomato tart. This delectable summer tart would make the perfect entrée, accompanied by a splash of piquant spring greens, at the next luncheon that you find yourself hosting. 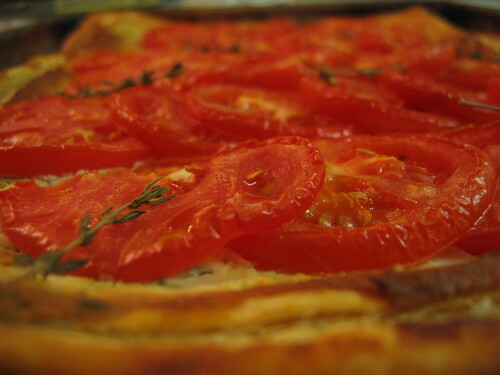 This tomato tart is simply an elegant riff on an old southern favorite, the tomato pie. If you’ve ever spent time south of the Mason-Dixon line (or wangled invitations from hospitable southern pals), you’ve probably had a taste of something like it. These pies often involve layers of ripe tomato slices, shredded cheese, and a drizzle of mayonnaise. In this version, the love apple is still the star attraction, but puff pastry and roasted garlic-infused goat cheese serve in supporting roles. It’s perfectly appropriate (and probably de rigueur at luncheons) to use knife and fork to cut through the crisp and flaky crust of this tart before taking a delicate nibble. You’ll note from the photo, however, that it’s also considered acceptable to treat this tart like a slice of pizza. In that case, feel free to gobble with gusto. Sliced and displayed on a fancy platter, the tart will also serve as a stylish appetizer for your next cocktail party. Whatever your pleasure, you’ll only want to make this with good tomatoes, preferably home-grown ones that actually taste like -- gasp!--tomatoes. So, enjoy. Have a good time at your luncheon. And don’t worry about the Queen of Tarts. Never one to miss a meal, she remains quite familiar with another mealtime concept – lunch – and does, in fact, eat it every single day. Roast garlic: Slice the tips from a head of whole, unpeeled garlic. Spoon 1 T. olive oil on top, sprinkle with salt and pepper. Wrap in foil and bake at 350 for 45 minutes. Allow to cool slightly. 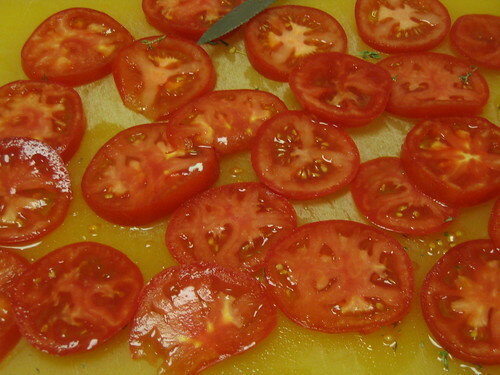 For tomatoes: Thinly slice tomatoes and sprinkle with salt. Drain in colander for several minutes. When ready to use, blot tomatoes to remove excess moisture. For tart: Follow directions on box for thawing puff pastry. Roll dough into large rectangle (it should fit atop a baking sheet.) 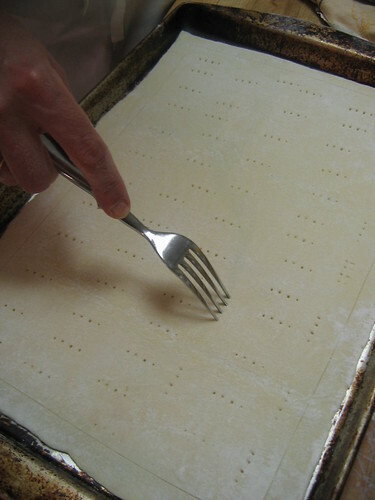 Using a sharp knife, lightly score a line all around the inside edge of the pastry (about ½ in. 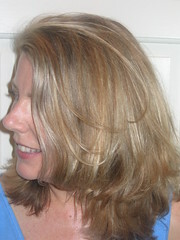 from edge), creating a frame. Do not cut all the way through the pastry. Prick the bottom of the dough all over with a fork. Put goat cheese into small bowl. Squeeze softened cloves of garlic onto cheese and add thyme, and salt and pepper. Mix well. Spread over pastry crust, staying inside the frame you have created. Arrange tomatoes in rows on top of cheese. Drizzle remaining olive oil over all and place thyme sprigs randomly. Brush outer edges of tart with egg and water wash.
Bake at 375 for 45 minutes, or until tomatoes are roasted and pastry is brown. Let sit at least 10 minutes before cutting into squares. Reporting from below the Mason-Dixon line, I'd say that here in the deep south, crust, cheese, and tomatoes come pretty close to what we call "pizza." I think I may short out my keyboard with drool. 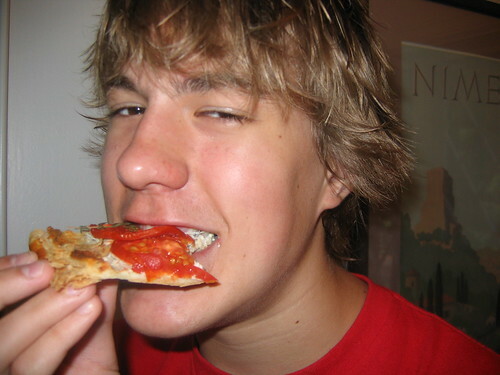 It makes an Auntie so happy to see such a handsome young man enjoying the pie of the week. I can't wait to catch a glimpse of the King enjoying his birthday pie. Mark, "That which we call a rose by any other name would smell as sweet." Perhaps you're chanelling the Bard? Currydude, Let me know when you're planning to try the Indian-spiced pie. I happen to be free that night. . .
SoCal Sister, As you noted, the young princes and the King take their pie-eating responsibilities very seriously.